Sure, freeing the slaves is cool, but you know what’s REALLY cool? Killing vampires with an axe. We discuss this year’s other Lincoln movie. Meanwhile Elliott performs a reenactment of Abe Lincoln’s hyper-ironic final hours, Stuart’s second career as a golem land developer is revealed, and Dan takes an entirely un-funny detour into the things that make him cry. 0:33 – 41:07 – Abraham Lincoln: Vampire Hunter takes us on a 100% accurate tour through American history. 58:18 – 1:05:07 – The sad bastards recommend. 1:05:08 – 1:06:22 – Goodbyes, theme, and outtakes. 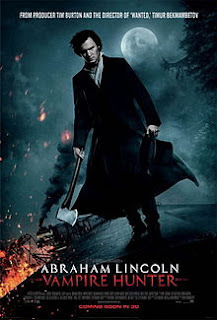 Hmm — This is very similar to my concept: Sir John A. MacDonald — Vampire Hunter. I mean, similar except in mine Sir John A. gets attacked and killed by a vampire in the very first scene. Still, it’s close. Damn it floppers! here I am laughing as usual and then you bring up the goddamn Iron Giant and I start crying like a baby again! Plus all that stuff about how sad it was that Lincoln was assassinated made me feel a bit bad as well. Anyhoo, great ep as usual! To answer one question from the podcast that was deemed too prickly and edited from the movie, the reason vampires were suddenly behind slavery and able to walk in the daylight was the extra infusion of melanin expressing gene had from a diet of strictly African descendant blood. The vampires still had to wear sunglasses because of an earlier botched experiment of feasting solely on the blood of gingers caused an irreversible albinism. Great show! You were highly recommended by the guys at 5by5.tv, and I am glad to have found this podcast. Are you excited to see The Hobbit in theaters? I was wondering if, in celebration of the upcoming movie, you might have a few words about two related flops in your next show. The first is the Ballad of Bilbo Baggins, sung by Leonard Nimoy. The second is The Lord of the Rings from 1978. I eagerly await a Tolkien-themed episode. Elliott should definitely sing an elvish song! I doubt Orlando Bloom will do a musical number in the film. Sweep the lady listeners off their feet!